If you want a tighter waist, a more defined jawline and brand new surge of energy then it all starts with getting down to single-digit body fat. 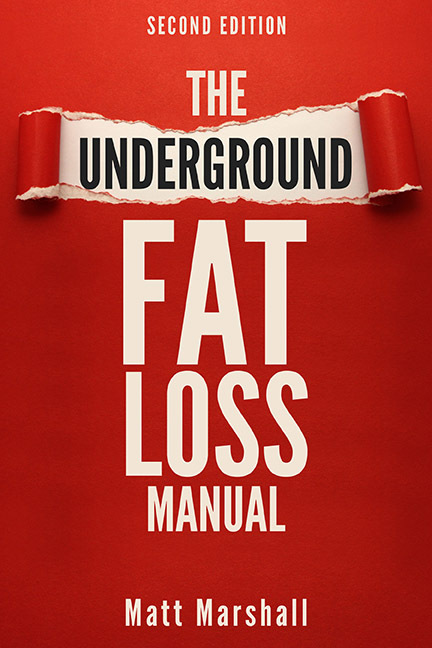 The Underground Fat Loss Manual shows you my exact step-by-step plan to making that happen. My private list of nearly "magical" foods for fat loss - including certain a certain 'white' carb that most fitness gurus consider completely off-limits. Gorge & get ripped? Why almost everybody is doing "cheat days" wrong. On page 28, you'll discover how pizza, cheesecake and donuts can melt away body fat. Exactly what to eat... exactly what workouts to perform... and exactly what supplements to take. No theory. No guesswork. The shocking no-supplements-required way to potentially increase your natural testosterone levels AND drop pounds of unsightly body fat. The 1 fatal flaw in standard bodybuilding and fitness model diet programs that - once fixed - can dramatically short-cut your path to single-digit body fat levels and 6-pack abs. Why drinking a protein shake after your workout could be making your belly fat... and what you should do instead. A comprehensive list of my favorite fat burning supplements. Surprise: They are cheap, safe and perfectly legal. How my strange "micro-cheat" strategy incinerates those last hard-to-lose pounds of stubborn belly fat. The #1 Thing Women MUST do different then men to achieve leanness. The Underground Fat Loss Manual is a digital e-book that you can download right to your computer and read on screen or print out at your convenience. The strategy within this manual will reveal the step-by-step plan to get down to single-digit body fat and effortlessly maintain your new lean physique. Best of all, this book comes with a 60-day money back refund policy. You get a full two months to read everything over and decide if this plan is right for you. Remember, you'll see the results with your own two eyes right away, but you get 60 days to decide if you want to keep the book or delete it and receive a full refund. So order your copy of The Underground Fat Loss Manual right now before this special offer expires and a price increase kicks in. This digital book is NOT available on Amazon or in any major book stores due to the controversial nature of this program. It is ONLY available on this website. Order now.